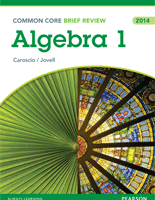 The Brief Reviews for Math books give students the tools they need to review and practice the essential skills required to be successful on end-of-course Mathematics exams. The Brief Reviews Student Edition (SE) includes paper-based diagnostic exams to help each student create an individualized study plan. Each chapter offers a review of key concepts and skills, sample problems, as well as hundreds of practice questions, calculator tips & strategies, and a Chapter Test. NY State Regents Exam: Algebra 2 & Trigonometry.